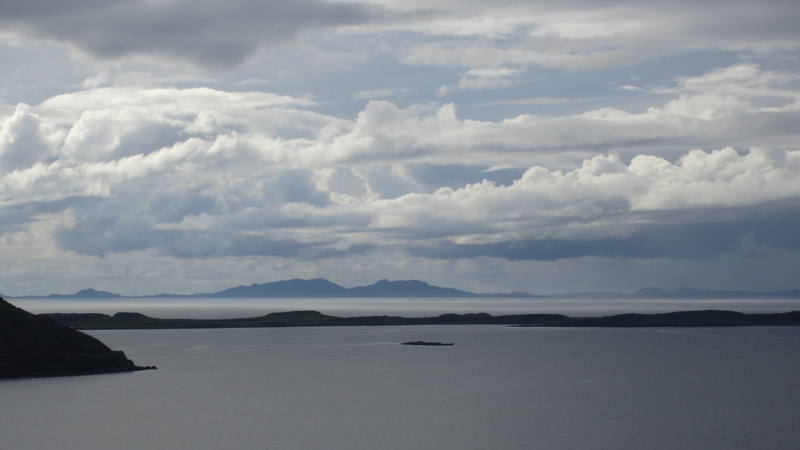 Started in 1972 by Eva Lambert at Waternish, on the north-west coast of Skye in Scotland, Shilasdair is one of only a few yarn producers that I know of that rely entirely on natural sources of dye for their production- an amazing thing really, considering the notoriously fickle nature of natural dyeing- and, let’s face it, all small-scale dyeing. Eva and her family moved to Skye from London in the early seventies; sleepy Waternish is now part of the Skye tourist trail in the summertime but it must have been really remote back then, a perfect place if you know what you want to do and have some skills to start with, I guess, but her strength of vision is quite amazing to me. It must have been a wonderful, gradual process, the development of her dyeing skills and practice, that are now so developed and coveted that the shop has passed on to a new owner, Judy, and Eva is now busily dyeing much larger quantities of yarn to be sold far away in London and beyond. 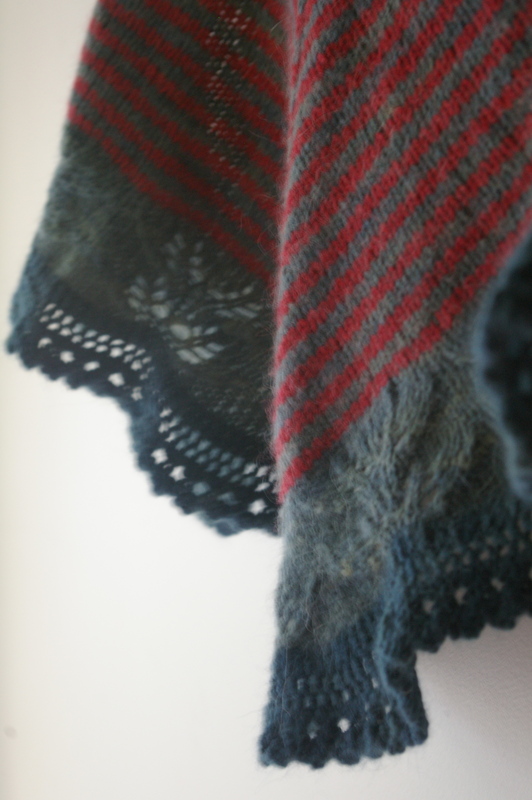 Eva has developed a palette of dozens of rich and subtle colours through the use of just a handful of dyes; some, like tansy and meadowsweet, she sources from her own dye garden and from the surrounding landscape and others, like madder, indigo and logwood, come from much further away. 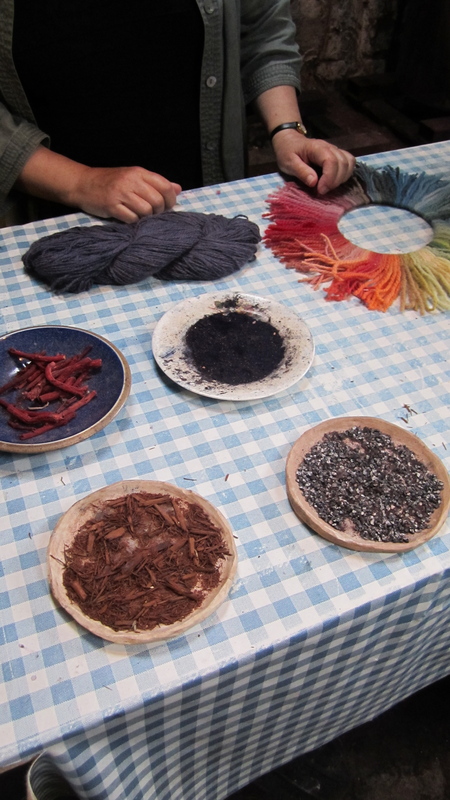 Various mordants are used, yielding different colours and shades from the same dyebath, but, more unusually, yarns are submerged in one, two or even three different dyebaths in order to create shades not normally available in natural dyeing, such as greens. 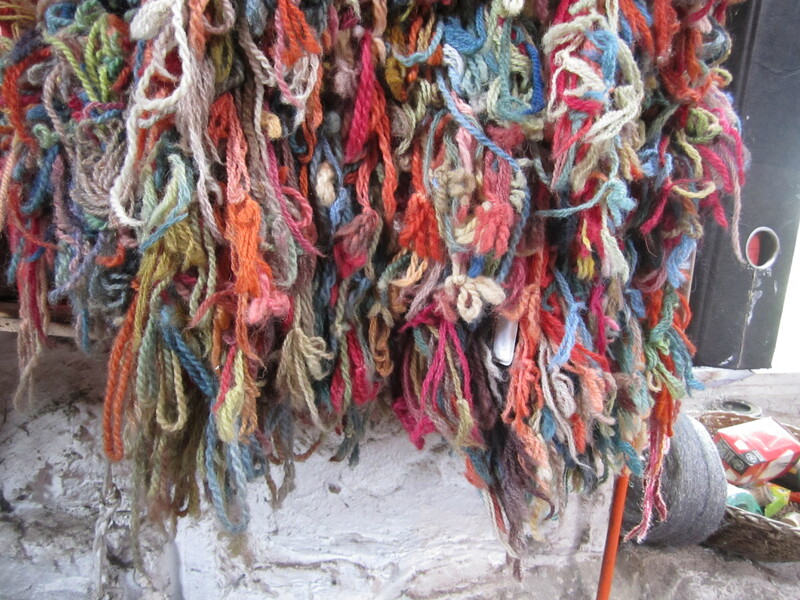 This technique, known as top dyeing, in combination with extremely soft water, is what has allowed Eva such a wide range of colours in her yarns. The influence by her travels and study in fine arts is obvious in the range of designs for garments, mainly jumpers, designed by Eva and her coworkers. 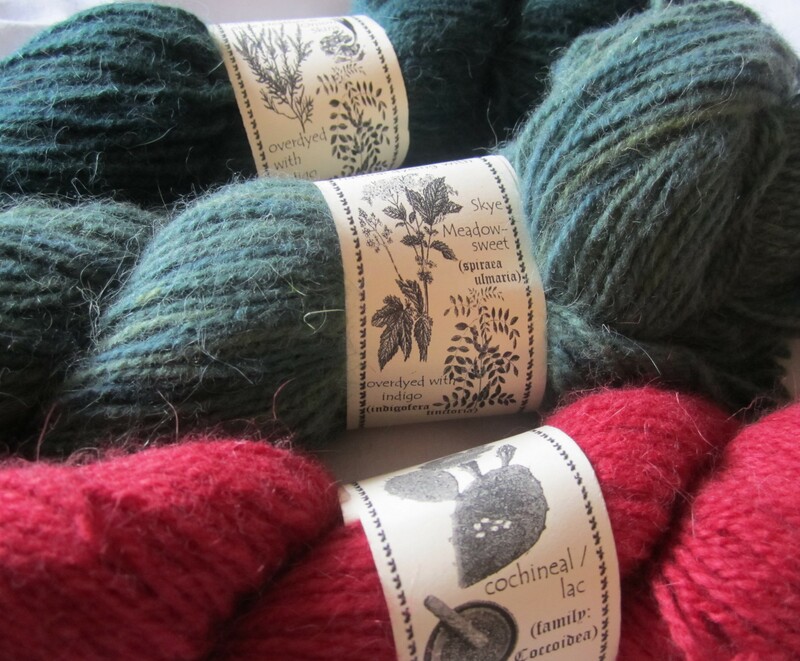 They are available as kits or ready-knitted by local craftspeople and really demonstrate the beauty of the textures and colours of her yarns. I knew, even before I got there, that some Shilasdair would be coming home with me ; ) Sadly, Eva’s 4-ply shetland is no longer available- it was phased out in favour of more luxurious yarns that sell better- but I fell in love with this 4-ply blend of British wool, angora and cashmere. Do go and check out this wonderful yarn and the dyer who creates it- she is amazingly talented, knowledgeable and committed to her craft. And I think that her yarns are really coming into their own with the current embracing of semi-solid yarns (where small dye lots and variances in colour are seen as a positive quality) and the ever-increasing interest in sustainable production practices, such as responsible natural dyeing. 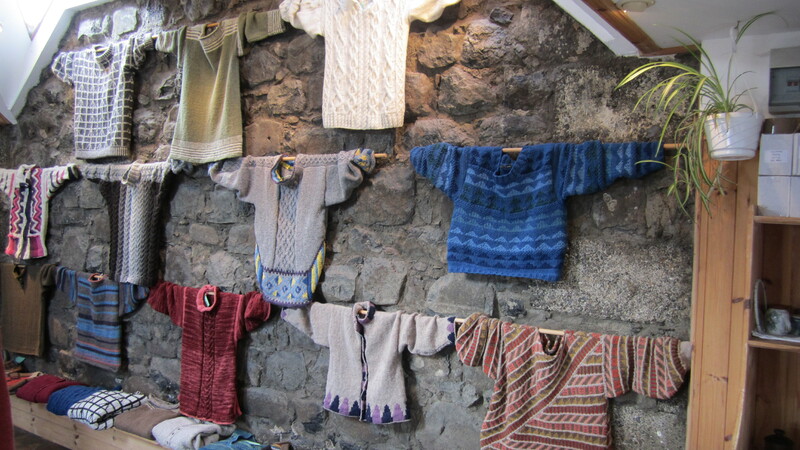 This entry was posted in knitting and yarn, outdoors, plants on May 20, 2011 by admin. I hope your ankle is feeling better soon Jules! Lovely to hear about Shilasdair! Wish I could’ve gone with you! Shilashair looks like a really interesting place. 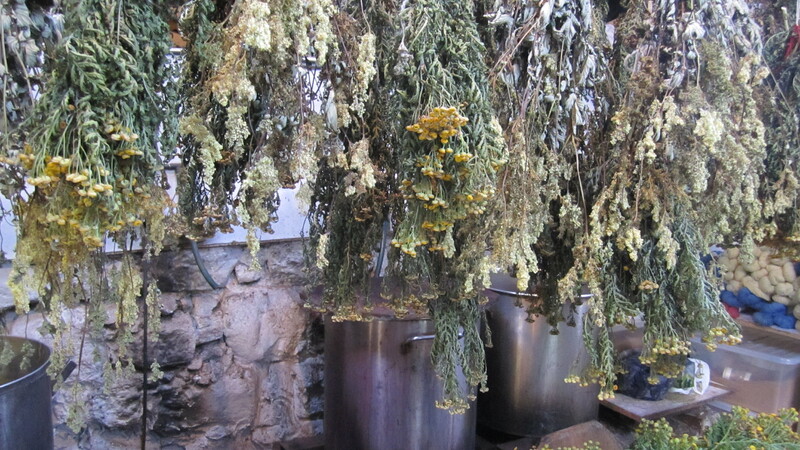 I really like the concept of natural dyeing so it’s nice to see it happening on a commercial scale. Truth be told, I don’t actually know much about natural dyeing, I just like the concept. 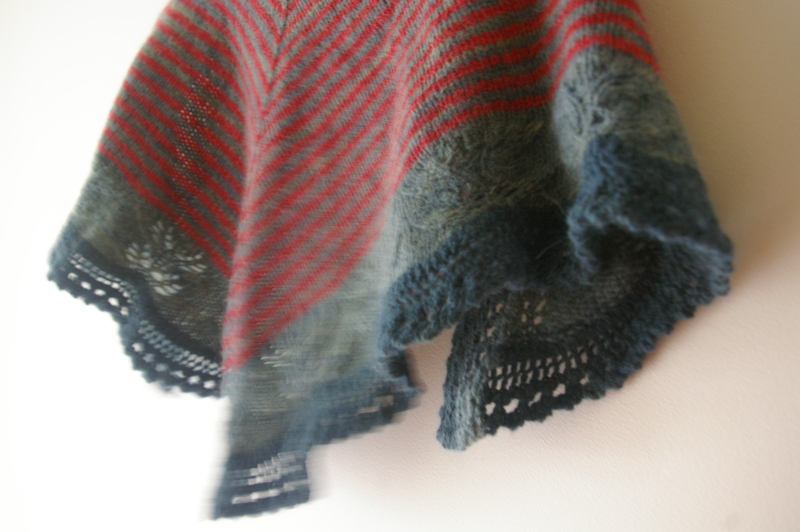 Your shawl turned out so so well, those colours look great together. I hope your ankle’s feeling better!